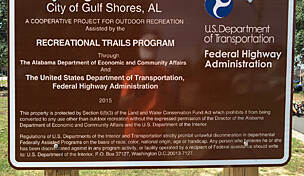 The Catman Road Trail is one of several in the Hugh Branyon Backcountry Trails network in Alabama's Gulf State Park. 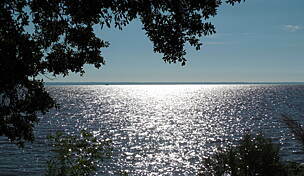 It directly connects to several others: Twin Bridges, Rattlesnake Ridge, Cotton Bayou and Rosemary Dunes for a seamless ride through the park. 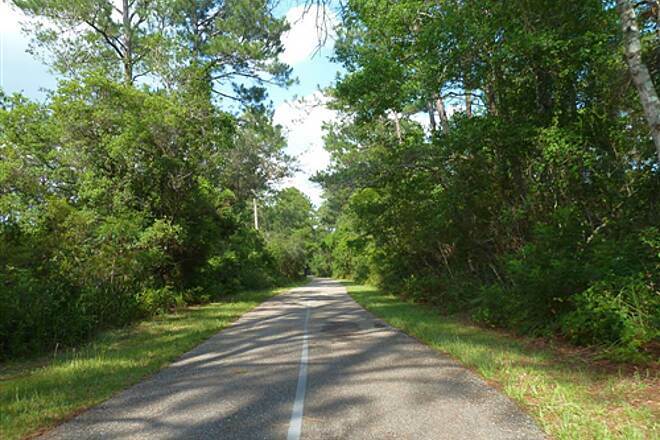 The flat, easy route follows a former roadway through coastal scrubland and pine trees. 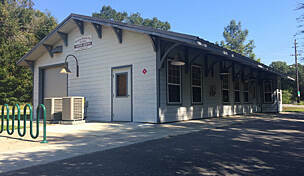 On the eastern end, a parking lot is available at the Marina Road Trailhead. 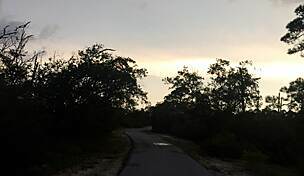 This trail is part of the multi trail Hugh S. Branyon system that lies in the bayou between routes 180 and 182 in Gulf Shores State Park.We entered behind the Publix and the trailhead for Catherine. 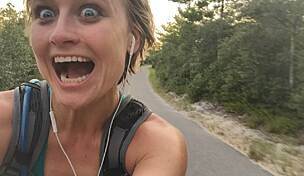 We rode about 28 miles amongst all the trails combined, including some that were technically not part of the trail system like State Park Road Number 2. Everything was paved and clean, and although there was a marathon wrapping up with quite a few dozen runners spread out of my of the trails, everybody was courteous and they were no issues. The only wildlife I spotted was a modest size snake crossing the trail in front of me, and plenty of birds. 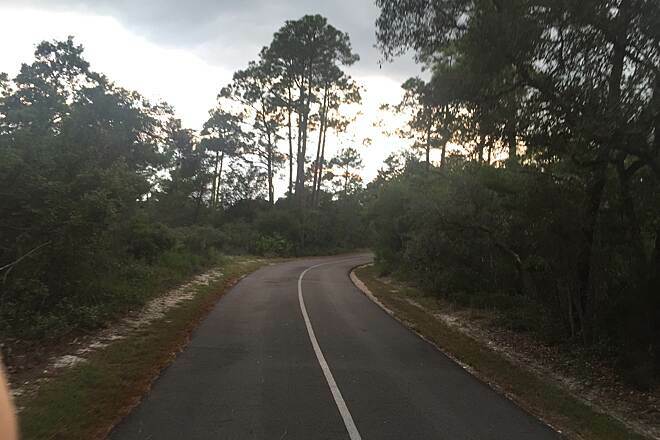 My wife and I were down at Orange Beach for a conference, I took my handcycle and was able to ride from our hotel and connect to the park trail system at the end of Catman Road Trail, where it ends on Hwy 161. 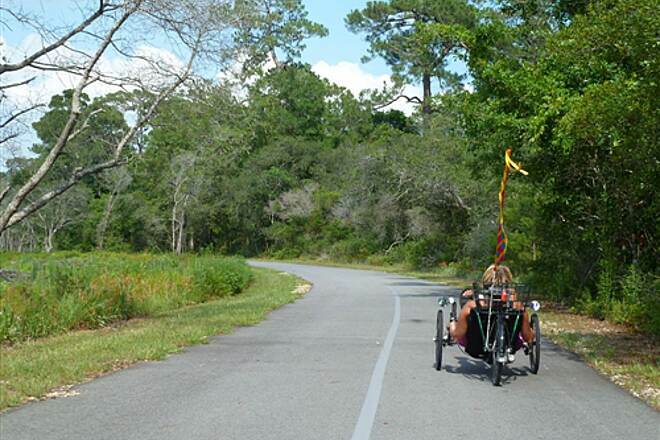 The trails were nicely maintained, clean, plenty wide for my handcycle for other cyclist to pass and for me to pass joggers, and flat except for a few small hills on Gulf Oaks Trail. 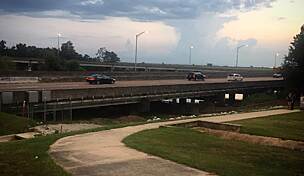 Even found that the Cotton Bayou Trail has been paved and was able to ride it to add some more miles. All in all I had a very good ride and want to go back down this fall when it is not so warm and ride again. 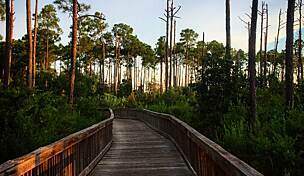 We camp at Gulf State Park as often as possible and these trails are a delight to ride. 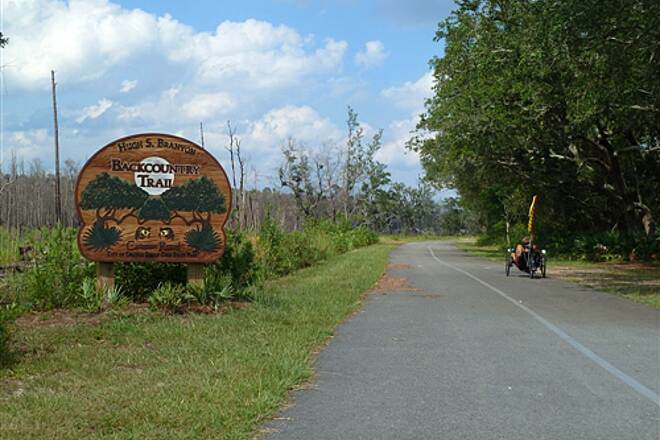 Leaving the back of the park along Campground road puts you on to the first trail, Catman Trail. 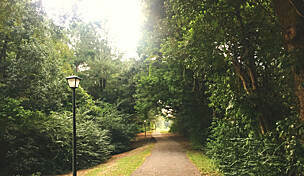 After riding along here you can connect to any of the trails in the system. 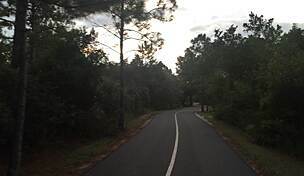 Rosemary Dunes branches off to the right past the rest rooms and travels down to the coast and ends at Hwy 98. 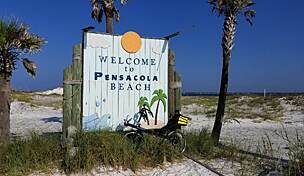 There is also ample parking there. Turn around and head back and there is a pretty good chance of spotting a 5-6 ft Alligator that lives just off of the tail about half way back. Once at the end you can go to the right and finish Catman Trail or go left and ride back to start the best of the bunch. 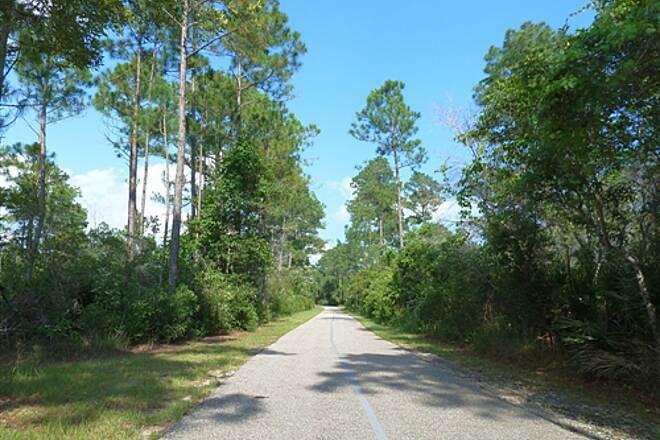 Rattlesnake trail goes off to the right and is a great well maintained trail that ends at the Orange Beach City Hall and Post Office. 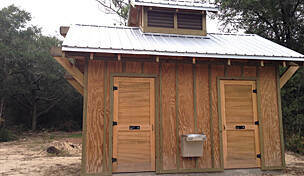 There are public rest rooms beside the Indian and Sea museum. The museum is open on Tuesday and Thursday only but the rest rooms are always open. Retrace your ride back along Rattlesnake trail and you will come to the absolute best of the bunch. Twin Bridges winds along over multiple wooden bridges and then runs right into Oak Ridge, easily one of the most scenic trails you will ever ride. 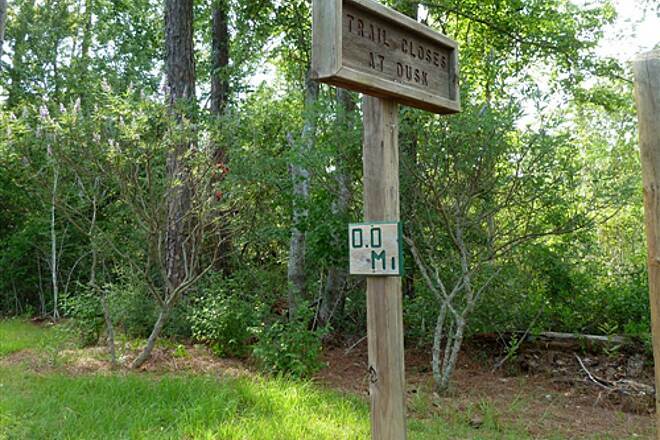 After riding all of these trails out and back you will have traveled just over 20 miles, if you ride around the campground like we do you can end up with 26-27 miles.